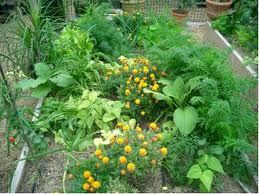 Companion Planting is the planting of different plants near each other for their benefit. There are several ways the plants can benefit from each other including pest control, pollination and nutrient uptake. Planting basil or marigolds next to tomatoes can help ward off whitefly or you can use nasturtiums to lure aphids away from your runner beans. Similarly planting strong smelling plants such as leeks, onions or garlic next to vegetables such as carrots can help ward off many pests such as carrot root fly, whitefly and aphids. These plants also deter slugs so growing salad leaf crops such as lettuce and rocket next to them makes sense. Another advantage of these plants is that they prevent fungal infections so they are perfect for planting near strawberries to stop them from developing mould. Lavender is another great plant for confusing pests and nettles attract white cabbage moths. Planting brightly coloured flowers near your crops will attract a wide range of insects to the area. Attracting more bees will result in better pollination and attracting ladybirds and lacewings will help keep aphids under control. Plants can also support each other. The traditional ‘three sisters’ approach involves planting a bed with sweetcorn, beans and squash plants (such as pumpkin and courgette) all growing together. Each plant provides natural shelter and protection for the other. The large leaves of the squash plants shade the sweetcorn’s roots from sunlight. They also act as a natural mulch by suppressing weeds and preventing moisture from evaporating from the soil’s surface. The tall stems of the sweetcorn provide a sturdy support for the beans to climb up. In turn, the beans fix nitrogen into the soil, which benefits both the sweetcorn and the squash plants. Mixing it up in your garden beds allows nature to keep things under control!